A carry pet is one that is included with 1 or 2 higher level pets with the intent that the higher level pets will "carry" the lower level pet through the battle to help it get a larger experience boost and thus level faster. All pets gain experience based on a specific equation (will be provided below). For this guide, the expected context is usually two level 25 pets and 1 carry pet, though the equations can be modified for other scenarios. Negative values result in 0 experience (this happens when opponent_pet_level - your_pet_level is less than -5). Multi-Pet Bonus: This bonus is based on the number of opponents faced and is denoted by the variable N.
Tamer Specific Bonus: This bonus is based on the tamer. 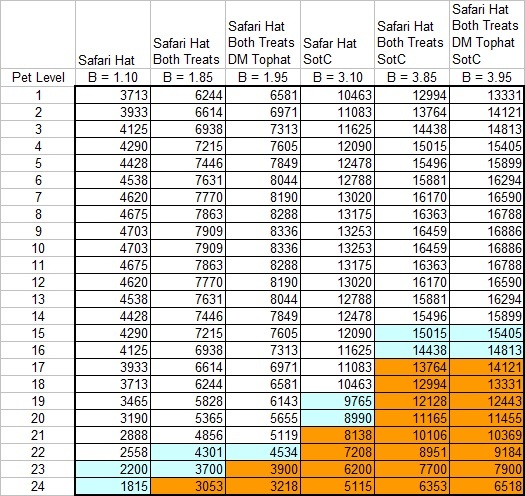 It doesn't appear to have any correlation to enemy pet rarety (epic vs rare pets have the same bonus for some sets of tamers for example). It may have some correlation to the Tamer's NPC level (not the pet level) as there are some trends, but there isn't enough data currently available to verify that. This bonus is denoted as T.
Experience Buff Bonus: There are various ways to gain pet experience buffs. All are additive together before multiplying. This bonus is denoted as B. B = 1.85 when using all 3 together. B = 3.85 when using all 3 together during a Pet Experience bonus event. NOTE: Kiamoto on the WoW Pet Battle forums figured out that the Darkmoon Top Hat adds an additional 10% pet experience gain. It seems to be additive (I.E. B=1.85 becomes B=1.95). Be careful buying these as they cost tokens, cannot be sent to alts, and disappear for good once the DMF ends. NOTE: Every so often a bonus pet experience event (Sign of the Critter, aka: SotC) occurs over the weekend. Whenever this occurs, you can add 2.00 to your experience multiplier. Doing tamers at this point can greatly increase your levels on a single pet, so you may want to use low levels to avoid wasting all that delicious EXP. Difficulty Bonus: The game highlights a "Difficulty Bonus" when levelling against higher level pets. This bonus isn't a multiplicative one and is already captured in the base experience equation. It is technically there when fighting lower level pets and serves as a penalty in those cases. It is represented by the opponent_pet_level - your_pet_level portion of the equation. For results ending in an decimal (.5), both the integer level above and below that value give max EXP. There are two special scenarios that can modify the equation further but aren't typical scenarios when levelling pets. Capturing a Wild Pet: Though not a hugely common occurrence since a lot of mass levelling happens at tamers, sometimes while levelling against wild pets, you might run into a rare version of a pet you need (or even a non-rare version if you don't have the pet at all). While it wasn't your intent to farm for that new pet, it just dropped into your lap. In scenarios where you are levelling a pet but also capture a wild pet, the experience you gain is decreased by 25% before rounding (So multiply by 0.75 before rounding). Multiple Carry Pets: Most of the time, a single carry pet is used with two level 25 pets. Sometimes, however, one might have two carry pets to split too much EXP (to not waste it) on a tamer that can be solo'ed by one 25 pet. If the two carry pets are equal level, they get split the EXP straight down the middle. If they aren't equal level, it gets a bit more complicated. 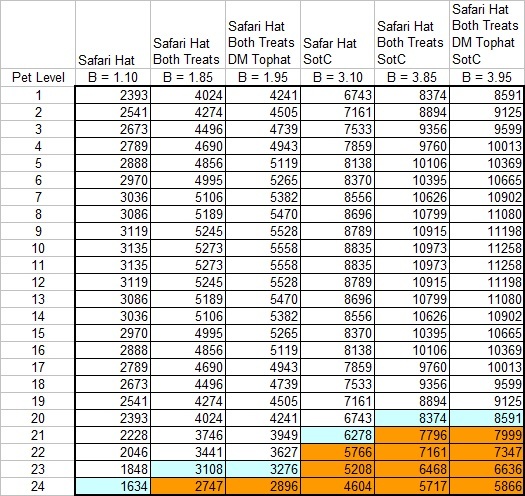 In that scenario, the pet with the higher level gets slightly less than half its expected EXP while the lower level pet gets slightly more than half its exptected EXP. I haven't quite nailed down exactly how it is calculated, but have been collecting data on it when I can. On my last run of level 23 carry pet paired with various other levels, it initially appears to be a small amount EXP per level difference between the two, but that is not exact. With the rounding of EXP it's hard to tell for certain the exact value until I go through more data. So for example without the safari hat and a team of 25, 23, and 22 against a Pandaria tamer I got 1392 for the 23 (expected 1400) and 1559 for the 22 (expected 1550). There will be more work on this in the future. Must not be 5 or more levels higher than the enemy pets. That last one is interesting. Notice that I didn't say "must have done something". It is very important to understand that all the pet has to do is be active at the end of a turn, as this opens doors to a lot of levelling strategies. What qualifies as being active at the end of a turn? Performing an action or passing with the carry pet. This is a common one you'll see in pet levelling strats. Even to this day, there are still a lot of guide writers that think this is the only way to get experience for your pet. However, there are others. Manually swap in the carry pet and then swap it out for another. Each swap counts as a full turn. This is probably one of the more common method you'll see in guides. When a pet dies, select the carry pet, then immediately swap to another pet. This one is also pretty common in a lot of guides. The important thing to note is that when a pet dies, the round isn't over, so selecting the carry pet finishes the round and meets the criteria for the carry pet to be active at the end of a round. The current pet died at the same time as the final enemy pet died. This method is most commonly seen in strategies that use [ability]Explode[/ability] (see common Mo'ruk or Thundering Pandaren Spirit strategies involving the [pet]Darkmoon Zeppelin[/pet]). 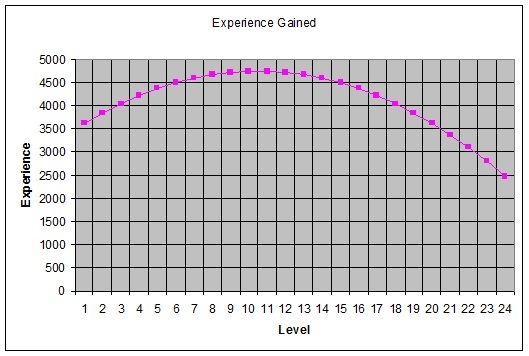 Below is a chart detailing the total amount of experience needed to attain a level and the amount of experience needed to get to the next level. 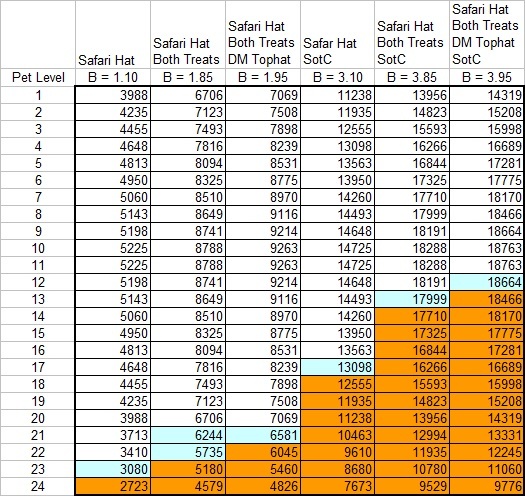 This is useful for planning out which pets to level if you aren't going for complete maximum experience gains. This section provides details on some special pet battle situations. Most (but not all) reference low sources of experience. The following world quest pet battles only award pet experience as if they were wild pet battles. They generally are not worth levelling off of. The new random visiting tamer has a chance to use 5 different teams. The tamer has an decent tamer bonus with a set of level 23 pets. Despite the 5 versions of this collector (per faction), you can only complete this battle once per day per account. Experienced gained from Menagerie battles varies by battle. Currently only Squirt gives decent experience. She provides experience as if she were a MoP tamer (T = 5.0). All other Menagerie battles either have an extremely small tamer bonus (T=0.1) or give single wild pet only experience. Neither scenario is worthwhile for levelling pets. The Beasts of Fable only give experience equivalent to a wild pet battle versus a single enemy. It is not worth it to level pets against them. The same is true for the final 4 Celestial Tournament bosses. Below is a chart detailing the level at which pet experience begins to be wasted in various scenarios. This can be useful for planning mass levelling sprees of similar level pets or for setting levelling pet caps in the teams addon Rematch. NOTE: Special thanks to Ril for inspiration and data related to this chart. 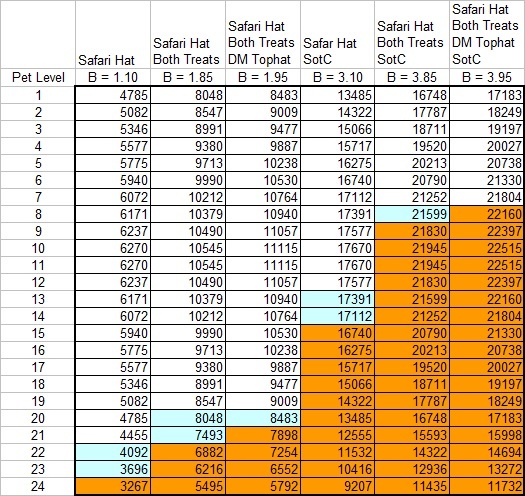 Below is a list of tamers, the experience equation of that tamer, and the pet level(s) that gain the most experience from that tamer. Equations are listed without any experience buffs (B = 1.0). Values highlighted in orange indicate that fighting the tamer under those buff conditions will result in levelling a single carry pet to 25. Values highlighted in light blue indicate that fighting the tamer under those buff conditions may result in levelling a single carry pet to 25, but it is not guaranteed. It depends on the amount of experience the pet currently has towards its next level. All values may be off by + or - 1 point due to how WoW rounds floating point numbers versus how excel does it. These tamers all have pets below level 25 and are spread out in a way that they aren't usually used for levelling. I've included the equations for each but have yet to generate any charts for them. These are here for informational purposes. Last edited by Jerebear on December 16th, 2018, 3:56 pm, edited 101 times in total. Re: Carry Pet experience forumla updated anywhere? This post is old data/info. The guide is currently found in the top post only. I may expand into this post as size is needed. 1. Pets at both level 10 and level 11 get the most experience per tamer battle in that set. They are the peak of the quadratic equation. 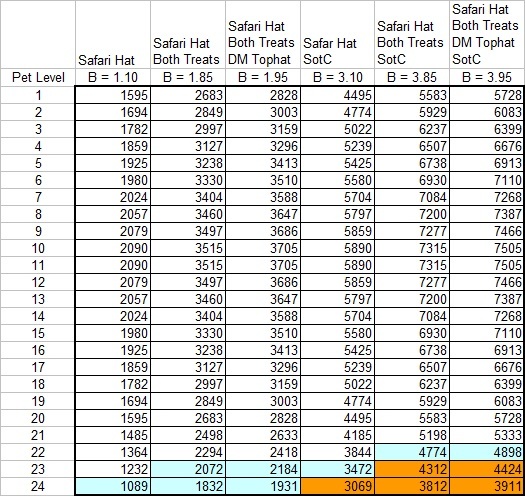 As a comparison, using just the safari hat against any pandaria tamer, a level 10 pet will gain 5225 experience while a level 22 will only gain 3410 experience. 2. Rare and Epic tamer pets from Cataclysm and Northrend all award experience using the same formula. So epic vs rare for tamer pets doesn't seem to affect experience gained. 3. Pandaria tamers award 2/3 more experience than Cata/Northrend tamers (or 1.666666666667x more). Once I get a lot more data and do some more verifying, I'll post the equation if anyone cares. I originally developed the equation using cubic interpolation of about 6 points, then guestimated it down to a quadratic using some assumptions and then went back and verified it using actual results. So far, all carry pet levels 1-22 have matched what the equation predicted. (I still need to do 23..can't verify 24 though). 1. I haven't nailed down the equation for outlands tamers since they are all different levels and I haven't figured out how non 25s fit into the equations for the other. It doesn't appear to be as simple as dividing by 25 and multiplying by 24...at least not on the surface. 2. I still need to verify against all levels for Cata/Northrend, but the 7 that I have done so far all match the expected equation. 3. I haven't tested to see if the food buffs and hat are multiplicative or additive bonuses. I'll probably do that after I collect all the other data. That equation doesn't account for my own pets level since they are both way farther out than +2 level difference, so how is the level 12 pet getting more experience than the level 1? Is there a different equation for the tamers? I wasn't able to locate one. I thought I remembered seeing a guide here with that info at one point, but can't seem to locate it. As a point of reference, just talking about the pandaria tamers. Take a level 1 carry for the krasasong wilds tamer vs take a level 12 carry for Farmer Nishi. The level 12 gets more exp. In both cases wearing the safari hat (double confirmed hat on both). I'm sure it is somewhere simple that I am just overlooking. EDIT: as an extra note, the amount of experience gained seems to go down again at some point. It's almost like the experience curve is parabolic in nature with a peak somewhere in the teens. Last edited by Jerebear on February 27th, 2015, 8:13 pm, edited 5 times in total. Jerebear wrote: I'll post the equation if anyone cares. Any of these pets above given 4 panda/spirit battles will ding or reach 24,93 (or similiar). I've found this way to optimize pet experience while keeping X battles needed down to minimum. Pets level up on specific pet level threshold and dont lose out on too much diminishing XP. I've tried level 1 pets, but they go straight to 12 and they land on 23½+ or 24 or something weird and you either need to lose out on alot of XP for the last batlte or use 5 wild pet battles ><. Another problem is backline damage intake with level 1s compared to 8/9 which are considerably more durable with exception against Water Spirit tamer where I simply save a level 22,9 or 23,1 pet. when you say 24,93, what is does the ,93 portion signify? It's not a notation that I am familiar with. Is it representative of the decimal point, or something else? I'm more trying to nail down the equation used. This will probably more beneficial to long term levelling than getting specific pets to 25. The idea would be to prep 15ish pets up to level 10/11, get setup for your tamer run, pop both pet treats and just use one level 10 or 11 pet per tamer. For the flowing spirit, either ignore getting the most exp, use a lvl10 or 11 H/H breed, or a lvl 10 or 11 magic pet. Since all the tamers in Northrend use the same levelling formula as Major Payne, it is probably faster to do all the tamers in Northrend following Pandaria (assuming you have the argent tabard or the ring from Dalaran). Mostly a way to maximize pet treats for long term. For people who are already at all 25's or that don't care about getting that, this won't be as helpful. So far everything is going very well in the data collection. I think in a couple days, I'll have enough for an initial write up. I'll need to check with a mod if it is ok to start a separate post for it (and link it here) just for presentation purposes. Jerebear wrote: when you say 24,93, what is does the ,93 portion signify? It's not a notation that I am familiar with. Is it representative of the decimal point, or something else? Lolfixheal is from the server Bronze Dragonflight-EU. I'm going out on a limb and saying 24,93 is the equivalent of 24.93. Those silly Europeans. Any chance you can post the xp gains you've gotten at each level? 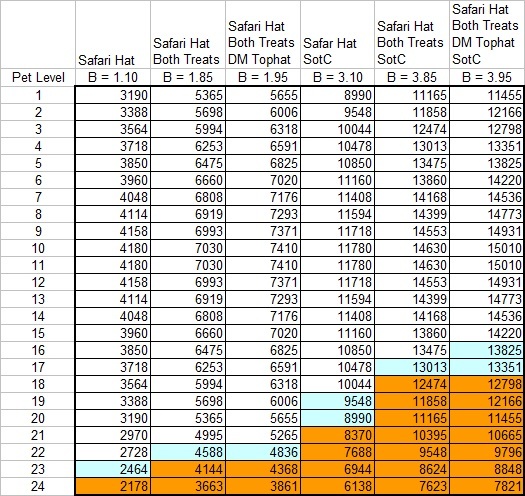 I've been using lesser treats, so the data I've been collecting are 1.35 * xp value. The xp values are derived from those collected values. Where x is your pet's level. Note that to check the level 24 values, I had to split between two different pets. The values came out as expected (after rounding) per pet with no deviations. I've also spent a lot of timing collecting data on the Northrend/Cata tamers and have found their values (so far) to all be the base value of my table * 0.6. Major Payne and Obalis give the same amount of EXP as the other Northrend and Cata tamers, despite the Northrend tamers being Rare instead of Epic. I ripped this off of WoWWiki. You can also go by Wowpedia, while not including the same amount of detail, it offers other information the latter does not. Now I'm not saying your information is incorrect in any way, I'm just sharing what's out there. I personally used to think the higher the quality pets that you battled, the more XP you received. As well as thinking if you killed your pet who was carrying (in the case of power leveling smaller pets) that you would receive higher XP as well... Anyhow, good luck and please share what ever information you end up gleaning! (I really wish the pet combat log were more than just a chat event that could be more accurately parsed, for example, listing your total gained XP and then the base you got + the 10% increase from buffs, like with rested XP, various buffs, reputation, etc...). The XP required to level for pets after level 10 has been dramatically reduced. If your pet team prevails in combat, experience is awarded to all surviving pets that participated in combat. Pets that do not enter combat have no effect on the experience awarded. Similarly, pets that die in combat also have no affect on the experience awarded. The experience that dead pets would have received is not "lost". Instead, the system considers dead pets the same way as non-participating pets. The level difference is capped at +2, so there is no benefit to defeating an opponent more than 2 levels higher than your pet. If your pet is 5 or more levels higher than the opponent, it will receieve zero experience. When your opponent is level 5 or higher, there will be two of them, and you recieve experience for each of them (200% normal experience). When your opponent is level 15 or higher, there will be three of them, and you receive full experience for the first two, and half experience for the third (250% normal experience). The quality of the defeated pet does not affect experience gain, and you get full experience if you capture or defeat your opponent. Example 1: If one of your level 3 pets defeats a level 2 opponent, it will receive 48 experience. Your level 4 pet would receive (1/3)(91 x 2) = 61 experience. Your level 5 pet would receive (1/3)(84 x 2) = 56 experience. Your level 9 pet would receive (1/3)(36 x 2) = 24 experience. Example 3: If two of your high level pets die in combat against a level 16 opponent, and your level 12 pet survives, the surviving pet would receive 147x2.5=367 experience. 1) If your pets are different levels, the higher level pet will "steal" a few experience points from the lower level pet. You can ignore this becauswe usually only one or two eperience points are transferred, which is irrelevant. 2) If your pets are different level, at some point the entire team will be penalized. The penalty will be the equivalent of the opponent being one level lower, which is very significant (about 30% reduction in experience). Beyond about level 10, try to keep all of your pets the same level, unless you are power levelling a baby pet, in which case the experience penalty is worth paying. Use the trainers and quests: At higher levels the experience grind is very slow. The fastest way to gain experience is to follow the quest line and defeat the trainers. Trainers award much more experience than opponents in the field. This means that you should maximize your experience from trainers, and avoid a situation where you waste the experience boost from lower level trainers by defeating them with a too high level team. Do not waste time farming for many rare pets at low level: You will often capture the same pet at much higher level, and you will have to abandon the low level rare to make room for the higher level rare. 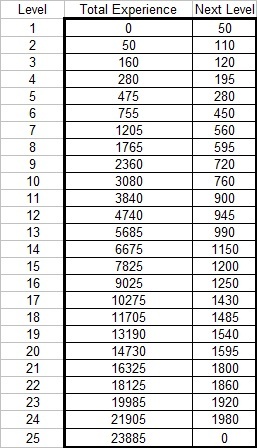 Plan your high level grind, not your low level grind: The first few levels are easy, it does not matter where you do them. At higher level, find a place with a nearby stable master to grind opponents that are equal or slightly weaker. The stable master is very important because higher level opponents will leave your team very weak, and you do not want to have to wait 8 minutes between each combat. For example, Winterspring is a good place to grind level 17 to 21 because there are many high level opponents available near to the Everlook stable master. Another good strategy is to grind using a herbalist and/or a miner, because you can make gold while you wait for the 8 minute cooldown. Also while in the healing cooldown, don't be afraid to trade out the hurt pets for another one you intend to level later, then when you can heal, it heals all of your pets whether active or not. This way there isn't as much down time. 1. The equation is incorrect in that it lists opponent_level + 9. It should be your_pet_level+9. The table in your post following the equation further shows it as the column and examples use your_pet_level instead of opponent_level in the calcs. 2. The equation, while probably capped at +2 for wild battles, doesn't appear to be capped for tamer battles, which would allow for the parabolic nature I noticed. 3. The tamers appear to have a 3x modifier (for Northrend and Cataclysm tamers) and 5x for Pandaria tamers. I think this one is probably subject to level caps going the otherway (I.E. your level 24 vs a level 3 tamer probably wouldn't give any exp). I haven't tested to see what that point is. Probably the 5 or more levels mentioned in the post you provided since it would either zero out or make the result negative. I verified this using bloodknight antari's data I have been collecting. At least according to both what I read and what you just posted. 5. For level 25 tamers (Northrend, Cataclysm, and Pandaria), pets that are level 10 and 11 get the most experience per tamer battle. I'd noticed this trend of diminishing XP with very low carry pet level, but I had no idea what the actual equation was. So thank you for that. Knowing this, it makes sense to always do the low-level tamers when your carry pets are still very low (WS and Deadwind are lvl 22 pets, for example--this would be optimal for a level 6/7 carry pet). 4x Pandaria tamers -- carry pet jumps to lvl 16, then 20, then 22.9, then 25, with virtually no wasted XP. Mind you, I haven't tested against any really low level tamers yet. I've tested against some outlands tamers, so that is as far as I got at this point. I think for me, long term, I will be levelling pets up to 10/11 using Pandaria wild battles, then I will pop all my food buffs and run each level 10 against a pandaria tamer. EDIT: Part of my motivation to do it this way is my alt gets a lot of EXP from doing wild pet battles, so I don't mind doing this. Usually takes 4 wild battles to go level 1 to level 10 ( 1->6, 6->7, 7->9, 9->10 ), which nets somewhere 500k+ exp for my level 88 per pet. As an update, I have moved the first post down and replaced it with the info I have obtained via testing. I think it is pretty complete. See what yall think. Any questions on it? Very nice guide (graphs, charts, and all)! It's so well done that we've decided to move it to our Community Guides section. Just a note: A few formatting changes were made to help make browsing through the guide even smoother; I hope that's alright with you [profile]Jerebear[/profile]. Thank you for putting so much effort into writing this up. Keep up the good work! Very nice. I had seen wowwiki equations but found they didn't conform to reality. It's nice having something that is accurate. You're still going to run into some oddities with specific setups. I'm not sure how many of you guys are programmers, but floating point values (values with a decimal point rather than just a whole number) aren't stored "exact" all the time. They can be a little off due to how floating point numbers are calculated and how floating point math works. Rounding the results can make it even worse. So while the exact equation comes out to 3118.5 which rounds up to 3119, the game could be storing 3118.49999999999999 (which rounds down to 3118), which is as close as the floating point number could get after the math was done. I am completely confident in the equation itself, especially since it is close to what wowwiki originally put up. Still if you find any data points that are off, let me know. In scenarios like I mentioned above, I would expect the result to be within 1 point off as rounding appears to happen after all the math is done in game. I haven't seen any oddities in the Pandaria, Vanilla, or Outlands tamers, but have seen one specific scenario where this appears to happen with Northrend/Cata tamers. Quintessence wrote: Very nice guide (graphs, charts, and all)! It's so well done that we've decided to move it to our Community Guides section. Thanks! Formatting changes are definitely fine and appreciated. I'm not very good at making things pretty, so definitely a good thing. Had a few successful carry pet battles against wise Mari (nothing repeatable, but got a few lucky successes). Each of the results indicated that the Celestial Tournament tamers use a T = 2.0 modifier (compared to 5.0 for Pandaria Tamers and 3.0 for Outlands/Northrend/Cata tamers). Wow, great job! Thanks a lot for making this [profile]Jerebear[/profile]!